Our web presses can produce folded signatures in 4 to 32 page increments. We’ll be happy to help you with publication layout options that can help you optimize your printing dollar. Just ask your sales representative for details. The right equipment is critical for scheduling, as well as economy. 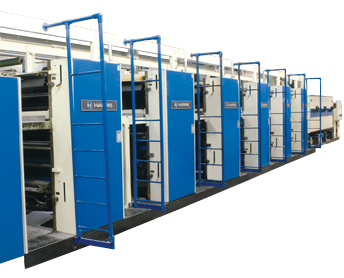 Complete with full sheeting and inline folding capabilities, Roebuck Printing’s presses will efficiently and accurately reproduce your publications on time and on budget. Operated by experienced craftspeople, our presses provide the versatility to produce your job with maximum efficiency and accuracy. Additional inline ink stations on the presses give our clients the flexibility of adding a spot color or varnish to a full color publication without incurring excessive added costs. And our Harris M200 five unit web press can produce 8-1/2 x 11 full bleed signatures. Roll sheeting capabilities allow us to offer you the economies of web press printing on jobs traditionally printed sheet fed such as posters, maps and flyers. All the presses are equipped with dryers and inline folders, so completed signatures are produced directly from the press. For short runs or immediate critical needs, Roebuck Printing’s digital printing team can produce a single copy or multiple copies for meetings, trade shows or samples. This is also useful for short run brochures and booklets. With multiple press lines, Roebuck Printing has the flexibility to meet ever fluid schedules and last minute art changes, as well as the ability to turn around your print project quickly.